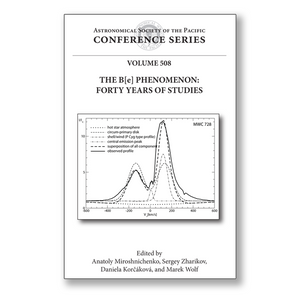 Editor(s): Miroshnichenko, A., Zharikov, S., Korcakova, D.
This volume contains the proceedings of the international conference “The B[e] Phenomenon. Forty Years of Studies” held at the Charles University in Prague, Czech Republic. The phenomenon is defined as the presence of forbidden emission lines in the spectra of B-type stars along with a strong excess of infrared radiation due to circumstellar dust. It is observed in stellar systems over a wide range of masses and ages surrounded by large and dense disks and has been recognized in pre-main-sequence Herbig Ae/Be stars, dusty symbiotic binaries, supergiants with slow winds, proto-planetary nebulae, and some binary systems that pass through non-conservative mass exchange phases. Studies of the B[e] phenomenon have resulted in the discovery of circumstellar disks around Herbig Ae/Be stars that led to a new theoretical approach to dusty disk modeling and planet formation. A long-term monitoring of the binary Luminous Blue Variable Carinae changed our understanding of the post-main-sequence evolution of massive stars. B[e] studies also led to the discovery of maser and laser line emission in the enigmatic object MWC349A. The conference addressed new results obtained since the previous meeting held in 2005 including theoretical studies of stellar evolution and formation of circumstellar matter, multicolor photometry, high-resolution spectroscopy, interferometry, monitoring programs, and discoveries of new objects with the B[e] phenomenon in the Milky Way and closest galaxies. This volume will be of interest to specialists working in various fields of astrophysics, such as evolution of stars and galaxies, interacting binary systems, radiation transfer, and massive surveys of astronomical objects.